How Do I Winterize My Water Heater? | Sunset West Plumbing & Rooter Inc.
HomeBlogUncategorizedHow Do I Winterize My Water Heater? How Do I Winterize My Water Heater? Winterizing Water Heaters Keeps Them in Good Condition for the Winter Months. The leaks from the water heater can cause water damage to other parts of your home. The water heater could crack. The reason that water heaters expand and contracts are because the metal is getting cold, not because the water heater itself has frozen. A lot of people do ask, “Can hot water heater freeze?” and the answer is no. If you were to turn on the faucet and no water comes out, the water heater isn’t the issue, it’s the pipes that the water runs through. The reason water heaters don’t freeze is that the burner or elements are constantly heating the water, so there is no risk in water heaters ever freezing. But because water heaters can crack and leak, it is still a good idea to winterize it. There are a couple of steps you can take in order to do this. Turn Off Water Supply: Before you do anything, you will want to turn off the water supply leading to the water heater. Turn Off Gas or Electrical Power Off: Unplug the water heater if its electric and then turn off the gas by turning off the gas supply line using the valve. Drain the Water: Once the water supply and power is off, you will need to drain all of the water out of the water heater. 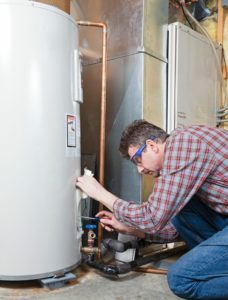 Remove Connections: The next thing you will want to do is remove the connections or pipes from the water heater. Reverse Order: When all of the water has been drained from the water heater, you will need to attach the connections or pipes back to the water heater, turn the gas or electrical power back on, and then turn the water supply on. Doing these things is going to decrease the chance of waking up during the holiday season to cold water. No one wants to only have cold water to bathe or wash clothes, especially when a lot of places are closed on weekends and during the holidays. Winterizing water heaters is a sure way to protect homeowners who want their water heaters to be in the very best condition during the winter months. 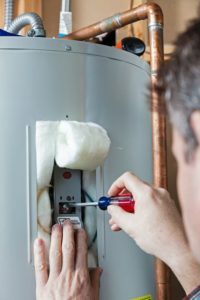 How Do You Maintain a Hot Water Heater? Good Maintenance for Water Heaters is a Good Practice to Implement. Winterizing water heaters might not be something you think needs to be done, but it is important to keep water heaters in good condition in order to extend its life. Because of this, many people ask, “How do I make my water heater last longer?” There are a couple of things that can be done in order to extend the lifespan of water heaters. The first thing that should be done is flushing water heaters. How often should you flush a hot water heater? It is recommended that water heaters are flushed every single year. A lot of people ask, “Is it good to drain your hot water heater?” and it is definitely good because it will increase the life of water heaters. The second thing that can be done for water heaters is to see if the anode rod is corroded. The purpose of the anode rod is to make sure that the inside of the tank doesn’t rust. Checking this every year will ensure that water heaters don’t have to be replaced entirely. The third thing you can do is insulate water heaters. This question is always asked: Do new hot water heaters need blankets? and it is good because well-insulated water heaters can increase your energy efficiency. Lastly, you can make sure that water heaters have a good temperature. Setting the temperature on both gas and electric water heaters can ensure that the hot water that is being produced will actually stay hot for longer periods of time. While these are great ways to keep water heaters lasting a lot longer, is also good for another few reasons. Below are things that can happen when water heaters have a lack of maintenance. Making sure your water is maintained can prevent these things from happening, when can lead to repair service. If are good on maintenance but you are looking tankless water heater installation in West Los Angeles, CA, please call Sunset West Plumbing & Rooter Inc. at (310) 454-2010! Posted in Uncategorized on December 14, 2018 at 9:38 pm by Sunset West Plumbing & Rooter.